Chennai, formerly known as Madras, is once again cherished though a slow motion video, that make feel one nostalgic about the city before it become modernized. An old gramophone spins merrily, pursued by fishermen carrying baskets of fresh catch… the camera moves then capturing the frothy waves crashing on the majestic rocks of Kovalam beach are the opening scenes of Madras is beautiful – a video by Madras Photo Factor. The excellent in quality video is an absolute treat to not only Chennaities, but anyone who had come across Madras. Shot by Balaji Maheshwar, a 28-year-old documentary photographer, the video encompasses everything that is this city. A beautiful tribute to the elegant beauty of Madras! The two and a half minute video was shot at the century-old dhobikhana, Marina Beach, Balaji Saravana Theatre, Kapaleeswarar Temple and Parry’s Corner. P.S. The team also reveal another video on the request of viewers, Madras is Calling, is a 4.33 minute-long footage shows more than enough in brief to make realize the love for city. It also has a Tamil background score which got it from A.R.Rahman’s composition for Swades. வெறும் வறண்ட வானிலையே மீதம் . while the climate remains just dry. P.S. "Rose water spattering" is a kind of gesture to welcome guest at any South Indian festivals. A short form of the Tamil Film Velaiyilla Pattathari, which means “unemployed graduate”, is a family-youth entertainer and also the 25th film of the national awarded actor Dhanush. Apt to the title, the film quite based around an unemployed graduate who stays idle at home and not looking into jobs out of his interest or subject he studied and following the ethics as a civil engineer. But how he grows out without losing his faith on ethics is better half. As the elder son in the family of four, Dhanush portrayed the prime character along with the boy-next-door attitude, thought it isn’t new for him; he has done what he deserves at best. As a regular father who abuses his son all the time for not getting a job, unlike his brother Karthik, who works in an IT company with enough salary, Samuthirakani’s strict tone helps betterment the role. It seems mother means Saranya; such how her impression created among the Tamil filmdom and she proves every time there couldn't be a nice mother like her, obviously. Being a force behind his son’s new lease of life and dream come true as her lungs transplanted to a great builder’s daughter, after she lost life to cardiac arrest has emotional touch. Glad the film doesn't turn into another mother sentimental drama but energetically rise up on a newly built platform. The music (by Kolaveri fame Anirudh) simply rocks among youth! The songs combine well with the story without redirected to distinct landscape unrelated to scenario. One can enjoy songs just like that for the local enthusiasm in beats and raw lyrics. I wish the directors, actors and musicians has to think alternate routes to inspire youth rather promoting alcohol as their inspiration, which I fear this trend would become a permanence source in Tamil cinema. It seems the climax fight is forced into the film to only exhibit Dhanush’s six-pack and thanks for giving life to the long lost moped bike, on which hero travel everywhere and also taking it for date with Amala Paul. VIP - A youth festival, just for celebration alone! 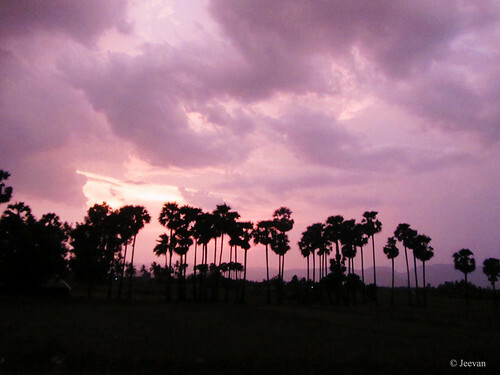 Chengalpattu, a southwestern suburb of Chennai on the Grand Southern Trunk road is surrounded by reserve forests and hills, giving way to number of wildlife species living at peace. But it’s hard to believe big cats like leopard exists! I wasn’t surprised when the news spread about spotting leopards on the outskirts of Chennai, but I was quite amazed nearly a year ago when I come to know about the Karadi Malai Camp (KMC) bordering Vallam Reserve Forest on the Chengalpattu-Thiruporur Road, through an article featured in the Hindu Metro Plus. Karadi Malai Camp is a kind of home-stay-come-camp, providing opportunity to those who love to stay close with wildlife and it is also home to the well known snake man Romulus Whitaker, the founder of the Madras Snake Park and Madras Crocodile Bank Trust. The Camp was run by him and his wife Janaki Lenin, whom I used to regularly follow on the Hindu Metro Plus, where she share her exciting stories and experience on the column “My husband and other animals”. You may think what is the connection between leopard and KMC? Because they are the first to come up with a camera-trap on leopard exist, setup on their camp several years ago. The “Karadi” is the name of their pet dog (German shepherd) which fall prey for the leopard and as a memory they dedicated the name of their pet to the camp. It seems the leopard doesn’t stay at Vallam Reserve Forest alone; it has been traveling quite many places these days to fall into the sight of human beings to scare. For the last one year, more than 80 people had reported about the leopard activity around the division of Chengalpattu and Thiruporur where villages share boarders with reserve forests. But there’s no complaint of leopard attack on human! It is believed the behavior between the leopards living in the Western Ghats and Eastern Ghats (ranging from Orissa to Sirumalai in Dindigul, on parts) perhaps vary, through their favorite prey remained dogs, the habitation of leopards in Eastern Ghats aren’t remote like the Western. I have come across Vallam Reserve Forest and the stretch between Chengalpattu and Thiruporur many a time when visiting my great aunt, who had then settled on the outskirt of Chengalpattu with Vallam Reserve Forest as their rear. When there wasn’t car, we used to take the GST road to reach their home by bus, but later years our usually route had been through Thiruporur. Not only was it short, but fabulous to pass on countryside, hills and forests. Not to forget my maternal grandfather village is also on this route and it was my most favorite place then to spend our summer vacations. 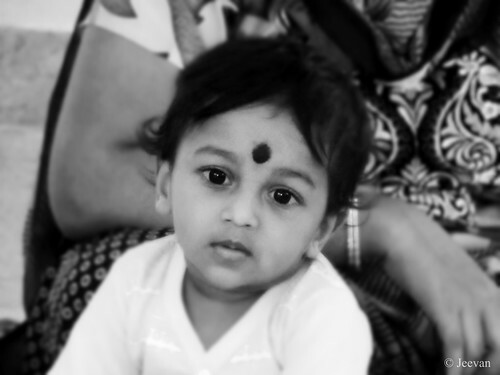 Those days we had to change three buses to reach my grandfather village and sometime we take vans from Kelambakkam. From Thiruporur, it was quite forest then until my grandfather’s village junction and it used to be terrific when we travel in car during nights. Many a time we had returned in nights from the village, when we go on as a day visits. The road was also narrow then to allow only one vehicle to pass at a time and either of them has to do off-road to give way for the other and this stretch would go through pitch dark in nights, where the shining eyes of animals would scare. I used to wonder many times what all animals are there in this forest, but until now I have seen only bonnet monkeys, peacocks, mongooses and wild rabbits. Hence I know there are jackals, deer and number of snakes, birds and reptiles. During our visits to the village, our uncle there used to take us to the forest adjoin their agriculture fields to pick cashews nuts. It was the most exciting thing for us then and we used to look forward to this opportunity to take a stick and venture into the forest. He also warns us to not make noise to keep away the forest officers, punishing for entering the forest without permission. There used to be number of deer’s in these forests, but now all are hunted down for meat by the villagers and even there is a horn of blackbuck still lying at my grandfather’s house. Even during my last drive across this route in April, I find few sign boards mentioning deer crossing area at Illalur Reserve Forest close to Thiruporur town! Back to leopard menace, it is believed the animal is the one that escaped from the Anna Zoological Park in Vandalur some years ago. But we can’t be sure, though the leopard hadn’t been trapped yet; the officials of the park still maintains a contraction message whether the animal escaped really or not. From wherever it may comes to exists, I am quite amazed how the leopard inhabiting very close to human habitation without disturbing each other all these years. It has also made clear, how wonderful our ecosystems should have been, still to make sustain a big cats like leopards in these small reserve forests, scattered among the villages and farmlands. I wish the government shows serious concern on protecting these forests and promote planting more saplings to maintain a much better forest environment to welcome back the lose species of this land. Thanks to the Karadi Malai Camp proprietors who are already in line of promoting the environment of Vallam Reserve Forest and creating water pools inside the forest to help animals in dry season. It is believed the leopards don’t come out of the forest unless their food source becomes scarce. I don’t think this leopard is intend to attack human (since no man is injured by it), but we perhaps come across them while they migrate from one patch of forest to another in search of prey. No doubt that anyone would scare seeing a dangerous animal all of sudden interrupt their way. I too wish alike anyone, before it become a man-animal conflict (since the leopard seems to wander into human habitation) forest official take some action that does not disrupt the freedom of man and animal. I think it is a kind of source control’s self and not only those done a mistake, fear prevents someone falling into the pit of unrighteous deeds. I was thinking about fear last night and a question rose within why should we fear sometime? I think if we fear for each and everything, we can’t survive quiet in this world. Fear is a tremendous inability prevents us from progressive life and let run only within a circle of certain. Fear is a common sense exhibits in everyone but how far we take it matters and being aware of things, certainly reduces the fear to least exist or exit quite. There are certain things we can’t avoid fearing and the most common cause was the condition of our health; which is the most fearful phase in my life. If I fall sick or feel something usually with health, the fear come stick quickly, even though I live with constant down progress with permanent disorder. I know anyone would fear falling sick all of sudden, but no one would react in the way I used to and connect with serious illnesses. If there isn’t fault with us, we no need to fear quite but sometimes situation goes against us though we are crystal clear water; anyone will use it or make dirty washing their hands. Fear is a compulsion when we survive in unsafe zone. Though courage is something one needed to battle the evil surrounded environment rather sitting ideally in fear. Everyone has an inbuilt fear I guess and it perhaps changes depend on the circumstance and state of the mind, but that doesn’t mean we are timorous. Sometime anger is also an expression of fear when something goes wrong or loses of achieving something and anger is also used as a tool to hide fear. a sweet imprint with lips. During my last visit to Mamallapuram while coming back from Alambara ford in April, we got to capture some photos on a magnificent sunset. The sun rose down wonderfully across various foregrounds and one remarkable sight among them was the palm trees… which produced stunning silhouettes beside the golden reddish sky. 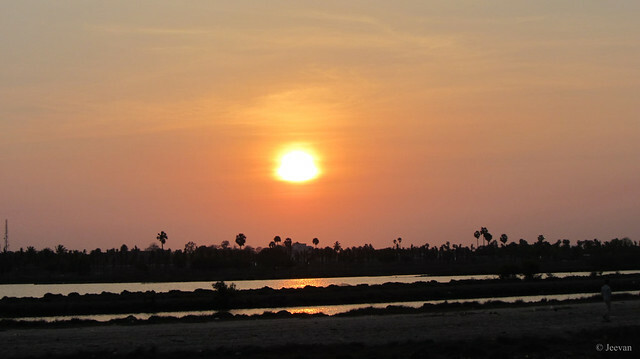 All these photos are shot from the backyard of the Mamallapuram town and across the Buckingham canal. 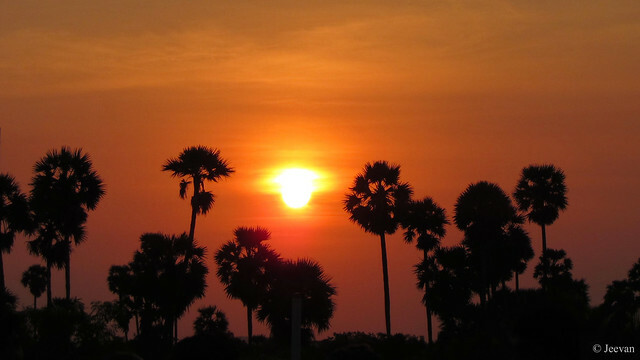 I have captured sunset many a time off ECR while returning from Mamallapuram in evening, the beauty of round reddish sun never cease to amaze me and the way it play hide-and-seek with palm trees were enchanting. 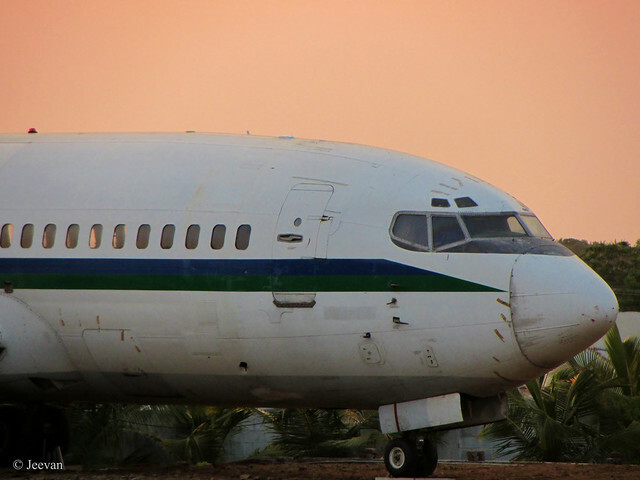 You perhaps remember this Airplane; I posted sometime long back here which I find parked at Mamallapuram. 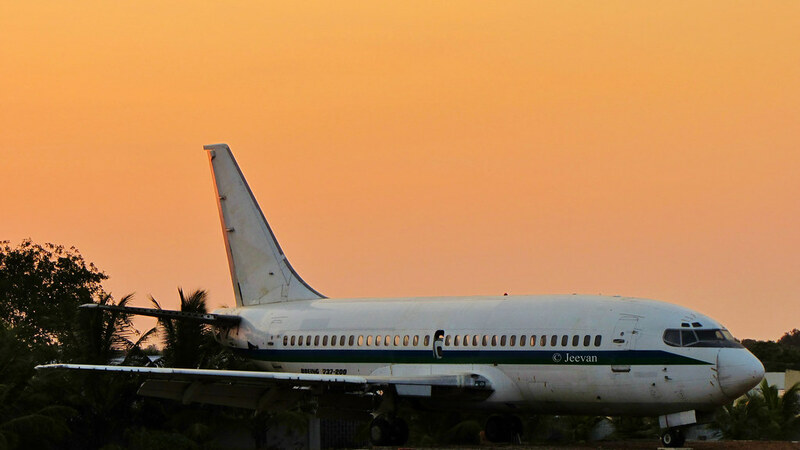 It was confirmed that the Airplane is yet to convert as a flight restaurant and a prime hotel management has impounded this Boeing 737-200 near Five Rathas of Mamallapuram and opposite to Chariot Beach Resort gateway. Life has been quite tiresome all these days, some indigestion or food poison has caused me sick and I’m still trying to come out to feel normal. I was vomiting, felt feverish and unlike to eat anything disturbed me and continues to produce certain effects here and there along with the hot weather switched on and off its engine. From the midnight of Monday to Tuesday night, the vomiting session took place and along with feverish and unlike to eat symptoms carried on until contacted doctor. Right now experiencing looseness, which could be perhaps because of overheated or reflection of medicines? Unexpectedly the death toll has touched 61 in the last week’s 11 storey collapses on the suburb. About 25 workers were rescued alive from the debris which lasted for a week. The news channels had just relaxed now after the govt.’s announcement of the place as protected area since the other 11 storey built aside the collapsed one is also in danger. It is expected to be demolished by bombs very soon. It seems like a worst disaster ever in the decade in Chennai after 2004 tsunami, the govt. has waked now to inspect the newly and under construction buildings on its strength. I think everyone expects something to provoke only then to take action or workout on constructive. I’m not interested on anything do to these days and feel so abnormal to even involve in regular activities but just watching TV to pass every day. Opened the laptop only to check mails and liking to be outside more. Glad this being a corner house I get to watch road activities from the front and side gates and lesser traffic in evenings enhances the breathe exercise. I watching sky, birds flew as clusters and gray clouds emerges, hoisting light rainbow colors… squirrels, parakeets screeching against sweetest Asian koels sings at backyard. I think I am sick only to seek so many happenings outside the home which I miss most of the time spent in front of the screen.